The International League for the Protection of Horses (ILPH) has announced the great line up it is fielding at the Scottish Christmas Equine Fair, Royal Highland Showground, 6 and 7 December. The news comes hot on the heels of "Horse and Hound" magazine's announcement that the Fair will be its 'Event of the Week'. The ILPH was founded in 1927 by Miss Ada Cole, when the ill treatment of horses exported to Europe for slaughter came to her attention. From her initial vision has grown the world's leading international equine welfare charity, attending to the needs of suffering horses wherever they are and however humble their role. Left to right: ILPH director Tony Tyler, ILPH representative for Scotland, Adam Fleming, Baron and Mac with Willie Craig, head carter, and Lorraine Johnston, assistant carter with Glasgow City Council. From its head office in Norfolk, the ILPH runs five Recovery and Rehabilitation Centres in the UK that look after as many as 300 equines at any one time. But the charity's role is not just limited to its on-site operations - it employs 16 full-time ILPH field officers, nearly all ex-mounted policemen, who investigate cases of cruelty and neglect, inspect horse markets and ports and give advice on horse welfare. They also check the horses that have been re-homed on the ILPH's horse loan scheme, which currently oversees nearly 1,700 rehabilitated horses and ponies that are currently in approved homes. And some of its Scottish success stories are to demonstrate their skills at the Scottish Christmas Equine Fair. ILPH Hamilton and ILPH Glespie are currently working for the Strathclyde Mounted Police. Hamilton, a stallion, was retired from the West Midlands Police Force when its mounted department was disbanded. Glespin is a heavy shire horse mare, and both horses are now central to the force's mounted division. Sgt. Jack Reddell of Strathclyde Mounted Police commented: "Both Hamilton and Glespie carry out a wide range of duties with us, and they are excellent four legged colleagues. We are looking forward to showing the crowds at the Scottish Christmas Equine Fair just what we can do." Elsewhere in the Glasgow region, two other ILPH horses are hard at work. 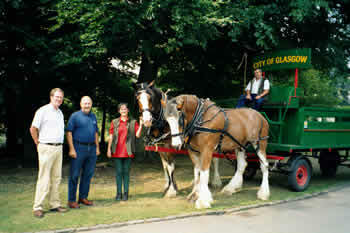 ILPH Baron and ILPH Mac work for Glasgow City Council and are part of the city's seven strong heavy horse team. Both horses are stabled at Pollok Country Park, a 361 acre park in the heart of the city. Their work includes starring at local gala days, pulling Santa's sleigh and switching on the Christmas lights, and taking part in 'country to city' days, when local school children can visit the park and see animals up close. Baron and Mac are no strangers to VIPs, and are great friends with the Lord Provost, Liz Cameron. Liz MacKay, one of Scotland's leading vaulting coaches, will be taking ILPH Aurora Boralis (Rory) and ILPH Isla (Ali) through their paces in thrilling displays of vaulting. Both horses are former police horses - Rory is an Irish Draught gelding, and Ali is a part Clydesdale gelding. Liz commented: "Both Rory and Ali are great horses, and they are bound to put on a good show for visitors to the Scottish Christmas Equine Fair." Sandra Turner, managing director of Contour Exhibitions and Events which is the firm that organises the Fair, commented: "We have a long and rewarding relationship with the ILPH, and we are delighted that the charity is bringing so many fantastic horses to the Fair. We are delighted, too, to have been chosen as 'Event of the Week by 'Horse and Hound' magazine - it will be a great day out for anyone who is passionate about horses." The Scottish Christmas Equine Fair will take place at the Royal Highland Showground, Edinburgh, on Saturday 6 and Sunday 7 December 2003, 9.00am to 5.00pm on the Saturday and 9.00am to 5.00pm on the Sunday. Ticket costs are: Adults, £9.00; Under 16's £6; Under 5's free; OAP's £7.00; Family Ticket (two adults and two children) £25.00. Advance booking discounts are available. Please call 01884 841925 or log on at www.contour.uk.net.